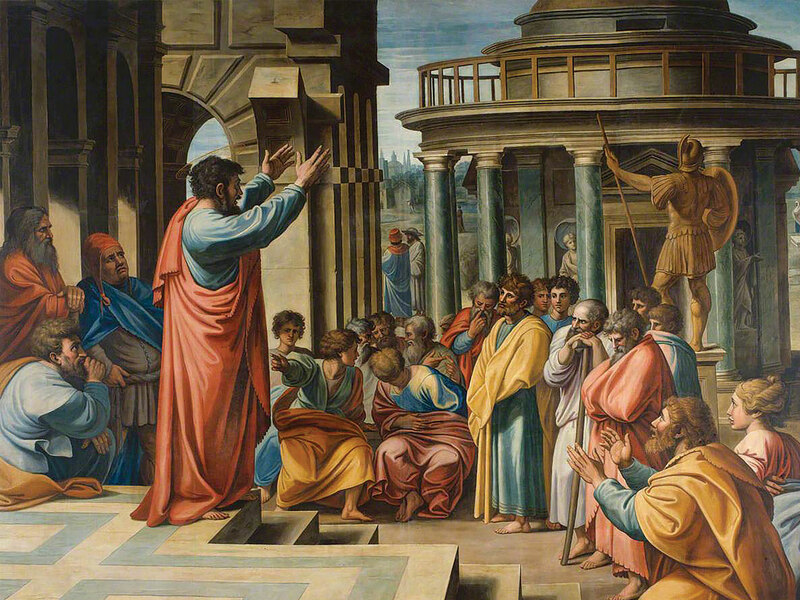 Throughout his extensive missionary journeys, the apostle Paul never asked for money from the people to whom he preached. By day Paul would toil at his trade as a tentmaker (Acts 18:3), and by night he would minister to the people wherever he was. In Thessalonica, he labored “night and day, that we might not be a burden to any of you” even as he “preached to you the gospel of God” (1 Thessalonians 2:9). In Ephesus, Paul “coveted no one’s silver or gold” and personally “provided for [his own] necessities” to show them “by laboring like this, that you must support the weak” (Acts 20:33-35). Even so, he stressed Christ’s teaching that “the laborer is worthy of his wages” (1 Timothy 5:18; Luke 10:7) and that “the Lord has commanded that those who preach the gospel should [make a living] from the gospel” (1 Corinthians 9:14). But of himself he simply said, “I have used none of these things, nor have I written these things that it should be done so to me” (1 Corinthians 9:15). We can understand then why Paul was so deeply moved when the impoverished believers in Philippi “sent aid once and again for [his] necessities” (Philippians 4:16). They did this without being asked, and apparently they were the only ones who did, for “no church shared with me concerning giving and receiving but you only” (Philippians 4:15). Paul recognized their sacrificial gifts came about because “they first gave themselves to the Lord” (2 Corinthians 8:5). Consequently, Paul could promise them, “My God shall supply all your need according to His riches in glory by Christ Jesus” (Philippians 4:19). That is, every need, not just their material needs. Image credit: Copyright © Royal Academy of Arts. Used in accordance with federal copyright (fair use doctrine) law. Usage by ICR does not imply endorsement of copyright holder. The Philippians had learned a marvelous truth that every Christian needs to know. As Paul told the Ephesian elders, “Remember the words of the Lord Jesus, that He said, ‘It is more blessed to give than to receive’” (Acts 20:35). Moreover, each of us should not give “grudgingly or of necessity [i.e., reluctantly or out of obligation]; for God loves a cheerful giver. And God is able to make all grace abound toward you, that you, always having all sufficiency in all things, may have an abundance for every good work” (2 Corinthians 9:7-8). Many Christians today, especially those in the Western world, have “sufficiency in all things” thanks to God’s grace. And we should happily respond in “abundance for every good work” to those needs and projects the Lord places on our hearts. Certain needs are more urgent, of course, and it is wise to be sensitive to projects that can make a significant impact for God’s work. 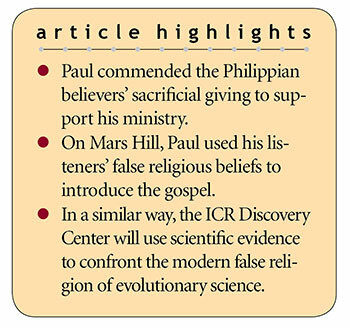 The ICR Discovery Center for Science and Earth History is just such a project—a unique 21st-century version of Paul’s Mars Hill address (Acts 17:22-34) that will reach hundreds of thousands each year. We should happily respond in “abundance for every good work” to those needs and projects the Lord places on our hearts. Paul’s address is a classic example of apologetics in action. By first recognizing where his audience was coming from, he used their false religious beliefs to introduce them to the One “who made the world and everything in it” (Acts 17:24) and to proclaim the gospel of Christ in a logical fashion. In many respects, science is the religion of our day. So, just as Paul masterfully used the philosophers’ religious idolatry as a starting point to present the gospel, the ICR Discovery Center will present scientific evidence to enable visitors to discover the truth of Scripture. ICR is currently working on cutting-edge exhibits that reveal scientific evidence and biblical truth in engaging and convincing ways, and we need financial help from God’s people to finish. If you want to be part of a truly significant project for the cause of Christ, please prayerfully consider helping ICR with a generous gift today. Cite this article: Henry M. Morris IV. 2018. Sufficiency, Abundance, and Apologetics in Action. Acts & Facts. 47 (3).